The Washington Post has published an editorial branding Council Member Marc Elrich, who is currently leading in the Democratic primary for Executive, as “an outlier who proudly positioned himself on the ideological extreme left” and “the most insistently anti-business and anti-development member of the Montgomery County Council for more than a decade.” Those who are interested in the Post’s opinion can read it here. 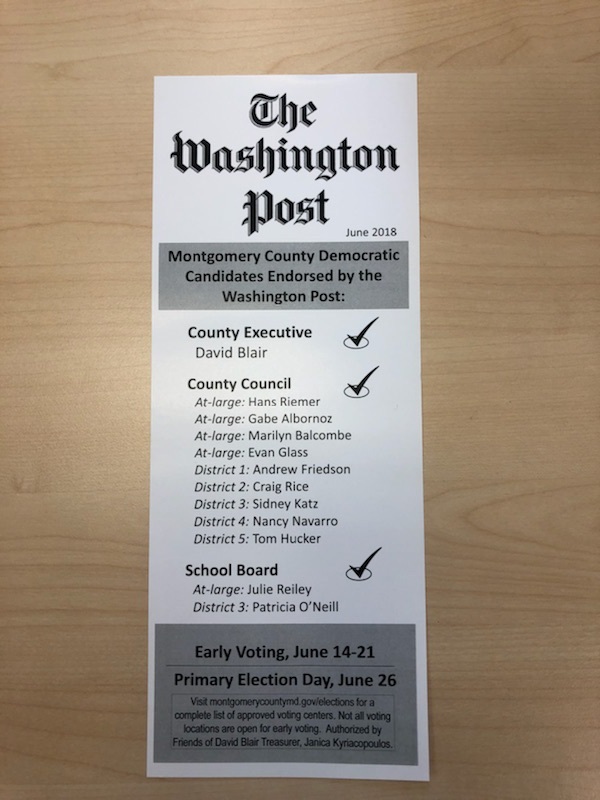 Two ballots were handed out today announcing county-level endorsements by the Washington Post. The first one shows all of the Post’s endorsements for County Executive, County Council and Board of Education. It has an authority line from David Blair’s campaign. We hear that several other Post-endorsed campaigns distributed it in addition to Blair’s people. The presence of an authority line makes it legal and the fact that it included all the county Post endorsements, not just some, is fair. 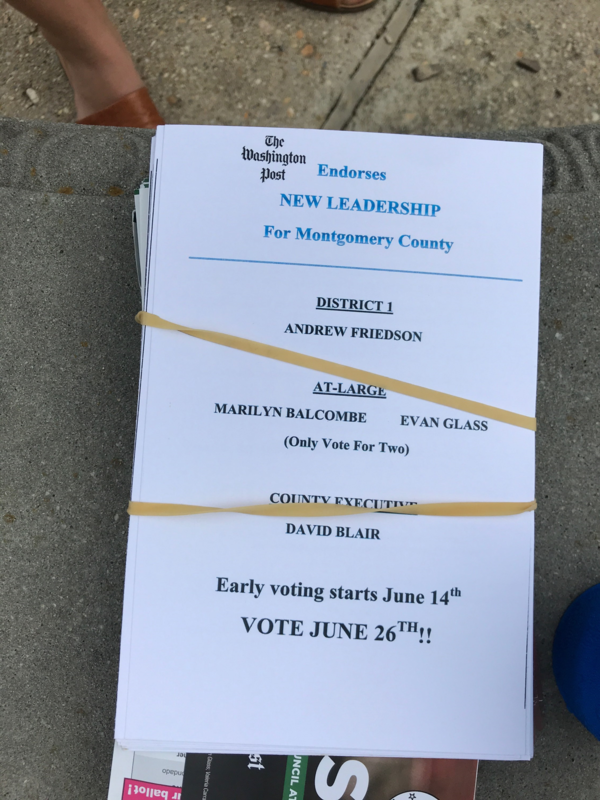 The second one shows just four of the Post’s endorsements: County Executive (Blair), Council At-Large (Evan Glass and Marilyn Balcombe) and Council District 1 (Andrew Friedson). The other two Council At-Large Post endorsees (incumbent Hans Riemer and Gabe Albornoz) do not appear. It has no visible authority line. This particular one was distributed in Bethesda but we have no idea how many were handed out. If it indeed lacks an authority line, this ballot violated state election law. It was also misleading because it only partially lists the Council At-Large endorsements. No campaign has admitted responsibility for this flyer. We have not seen a “Washington Post Ballot” in the past. But if it continues, and if campaigns can agree on funding it, it could conceivably be turned into an alternative to the Apple Ballot. 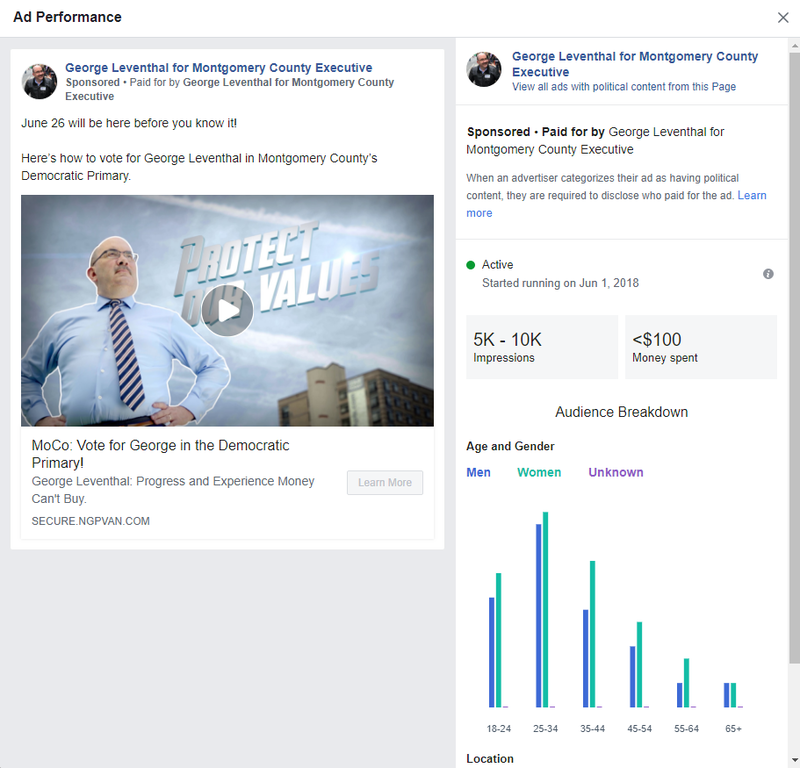 Is This the Most Expensive Facebook Ad in MoCo Politics? County Executive candidate David Blair wants you to know that the Washington Post has endorsed him. Wait, that doesn’t do it justice. He really, REALLY wants you to know that. Why do we say so? Because he may have purchased the most expensive Facebook ad in the history of MoCo politics to publicize it. 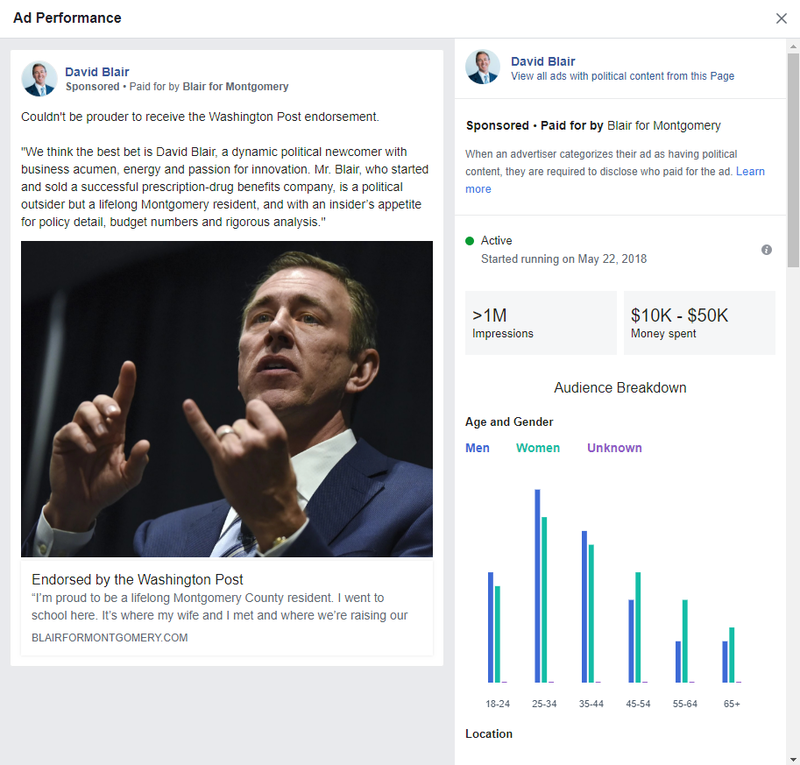 Most Facebook ads from state and local candidates cost less than a hundred bucks and run for a few days. The more you pay, the bigger the audience, but there is considerable variability in exposure and targeting. Still, a $50 ad on something good is a cheap way to get your name out there. If every exposure costs two cents (a VERY rough guesstimate with a lot of spread), that fifty bucks could get you on 2,500 feeds and draw a few dozen interactions. The exact stats on ad cost and engagements are available only to the advertisers. But Facebook has a political ad tracker that reports stats in ballpark ranges. Here’s a report of an ad that Council Member George Leventhal is running on his hilarious Avengers-themed campaign video. He spent up to $100 on the ad and it showed up on 5,000-10,000 feeds. (The actual people count will be less because some will have seen it more than once.) This is a very typical ad in MoCo politics. Now here is the ad Blair is running on his Post endorsement. The report indicates that he spent between $10,000 and $50,000 and it showed up on more than a million feeds. By the standards of MoCo politics, that’s unheard of. Even David Trone rarely spends more than $1,000 on his Facebook ads. 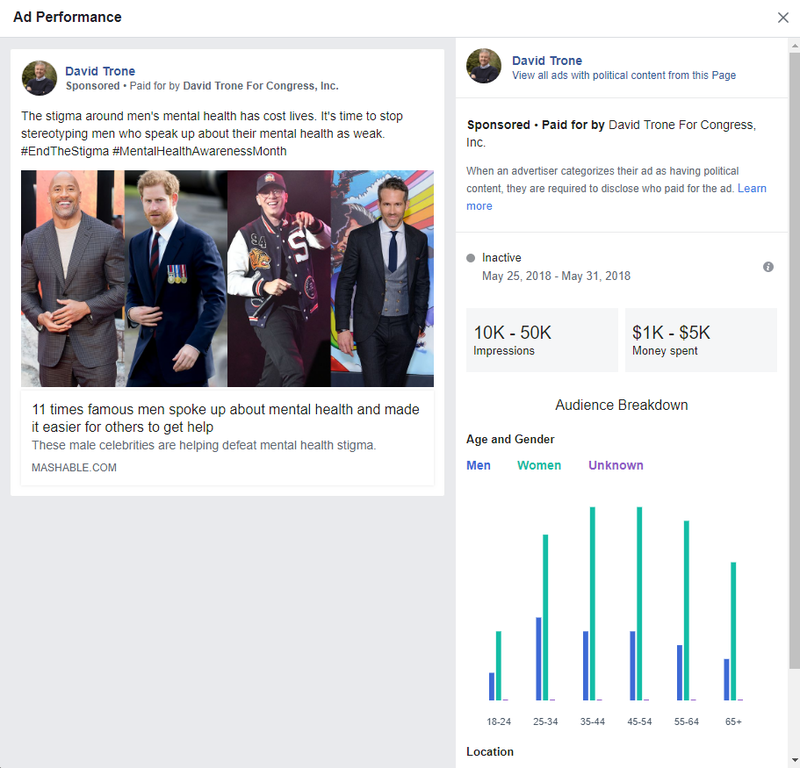 We know of one ad – on men’s mental health – on which Trone spent between $1,000 and $5,000, receiving between 10,000 and 50,000 impressions. So if you live in MoCo and have a Facebook account, we bet you know that David Blair has been endorsed by the Washington Post. And if you didn’t, well… you need to log in! Disclosure: Your author supports Roger Berliner and spends way too much time on Facebook. The Washington Post has written a second editorial endorsing David Blair for Montgomery County Executive. You can read it here. The Washington Post’s endorsement of businessman David Blair hit like a grenade this past weekend, blowing up the County Executive race. What does it mean? First, in reading the language of the Post’s endorsement, we are struck by how closely their views on the challenges facing the county resemble our own. The majority of these opening three paragraphs mirror what we have been writing about the county economy for years. These seem like boom times in Montgomery County, the mainly rich suburb that has absorbed roughly 100,000 new residents since 2010 to a population now approaching 1.1 million. Amazon (whose CEO, Jeffrey P. Bezos, owns The Post) has shortlisted the county for its second corporate headquarters; construction cranes tower over Bethesda and Silver Spring; and the public school system, one of the nation’s largest, includes some of the best high schools anywhere. That’s why it’s easy to overlook some ominous signs of fiscal and economic trouble ahead. A burgeoning population of retirees, immigrants and other less affluent residents has strained local resources and budgets. Those moving into the county tend to be poorer than those leaving. The chasm between economically prosperous pockets (such as the ones dominated by cranes) and stagnant ones is widening. Most worrying, business and job growth are anemic. That’s the unsettling backdrop for the June 26 Democratic primary, which is likely to determine who will run the county for the next four years. County Executive Isiah Leggett, a deft and capable manager, is retiring after 12 years in the job (and no Republican has won an election in Montgomery since 2002). The central question is which of the candidates for county executive is most capable of juicing a sluggish commercial environment — the only way to broaden the local tax base so it can sustain the county’s excellent schools and progressive services. The Post framed the election’s central question correctly. And their policy view, clearly established in the language above, will no doubt influence their choices for County Council. That said, they do not share your author’s view that governing experience is useful for addressing these challenges. So be it. The Post has a pretty good record in top-tier MoCo Democratic primaries. They endorsed Chris Van Hollen (CD-8) in 2002, Ike Leggett (County Executive) in 2006 and 2014 and John Delaney (CD-6) in 2012. They also endorsed Kathleen Matthews (CD-8) in 2016, who finished third. Even so, the Post is not a king-maker; one of the good things about MoCo politics is that we have no king-makers here. But their endorsement matters, especially when five candidates are vying to be the chief rival for Marc Elrich. Consider what Roger Berliner (your author’s choice), Bill Frick or Rose Krasnow would have said if they had gotten the Post endorsement. If Berliner had received it, he would have told non-Elrich voters, “I am the one who combines the Sierra Club, moderates, District 1 voters and now the Post. I’m the alternative to Elrich.” Frick would have said something similar while substituting realtors for the Sierra Club. If Krasnow had received it, she would have said, “I am the only woman in a primary in which sixty percent of voters will be women and now I have the Post. I’m the alternative to Elrich.” None of these things can be said now. All three lose the opportunity to leverage the Post endorsement to expand outside their geographic bases. It is sometimes said that Elrich has a ceiling. Some voters will find a decades-long socialist who equates transit-oriented development with ethnic cleansing and favors rent control unappealing. But Blair has a ceiling too. That was expressed by a commenter on Seventh State’s Facebook page who wrote, “I don’t want a businessman political newcomer who is trying to buy the election.” Fair or not, that is a common sentiment among Democratic activists, and those who feel this way are not persuadable on this point. Blair can send them thirty mailers and they won’t budge. How many rank-and-file voters have this view? David Trone, who shares this handicap, received 22% of MoCo’s vote in the 2016 Congressional District 8 race. That’s an imperfect analogy because CD8 omits some relatively moderate areas in MoCo’s Upcounty and Trone was not talking about the unpopular nine percent property tax hike in his campaign. Still, Blair will need more than 22% to win. Besides Blair, the other big winner from the Post’s endorsement is Elrich. Elrich has been crusading against rival candidates who have been supported by wealthy businessmen for years; now he gets an ACTUAL wealthy businessman as perhaps his chief opponent. Elrich is no doubt rubbing his hands together in glee as his progressive hordes gird for battle against plutocracy. His field coordinator must be dizzy with joy. Both the Elrich and Blair campaigns need to consider the following question. Which group is larger in the Democratic primary electorate: the people who believe that taxes have gone up but their service quality has not or the people in Elrich’s base? If the former outnumber the latter – not an impossible prospect considering that a majority of Democrats voted for term limits two years ago – then maybe an outsider has a shot. It would be totally unprecedented given that every prior MoCo Executive has had governing experience before assuming office. But Robin Ficker winning a charter amendment vote by forty points was also unprecedented. Thanks to the Post, a wild election has gotten a little wilder. There are only forty-three days to go before this story reaches its momentous conclusion! The Washington Post has endorsed David Blair for Montgomery County Executive. Read their endorsement here. Most influential endorsements have been made in our state and local races but one big one still has to drop: the Washington Post. In contested races for Executive and County Council over the last three cycles, the Post has gone 18-7 – a 72% win rate. Its misses included Howie Denis (Council D1, 2006), Mike Subin and Bo Newsome (Council At-Large, 2006), Royce Hanson (Council District 2, 2010), Duchy Trachtenberg (Council At-Large, 2010), Tom Moore (Council District 3, 2014) and Evan Glass (Council District 5, 2014). Other than maybe Newsome, all of these were credible candidates and three (Denis, Subin and Trachtenberg) were incumbents. In 2014, the first mid-term year in which Maryland had a June primary, the Post endorsed for Executive on May 2, for County Council on May 26 and for General Assembly on May 30. Candidates are eager for the Post to endorse sooner rather than later because they would like to add the endorsement to their yard signs, mail and walk lit. We know that the Post has been interviewing Executive and County Council candidates. We would not be surprised if their endorsement for Executive comes out in a matter of days.